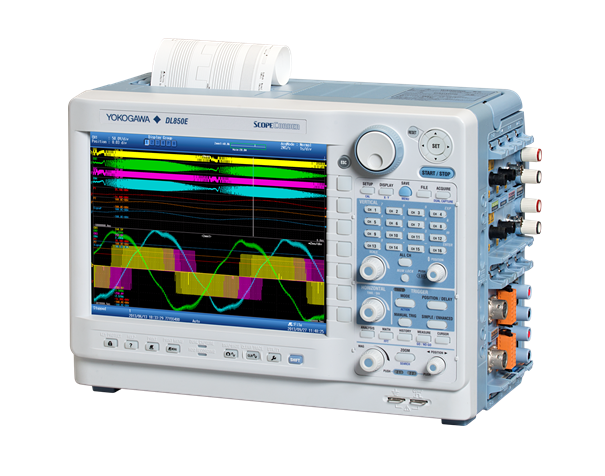 The most feature-rich ScopeCorder, the DL850E combines a mixed signal oscilloscope and portable data acquisition recorder into a modular platform designed to capture both high-speed transients and low speed trends. Combining signal conditioning, signal processing, and large recording memory, the DL850E is ready to be configured to meet your application demands. With its menu-driven user interface, advanced features are easily accessible, so you can gain insights and solve problems faster. 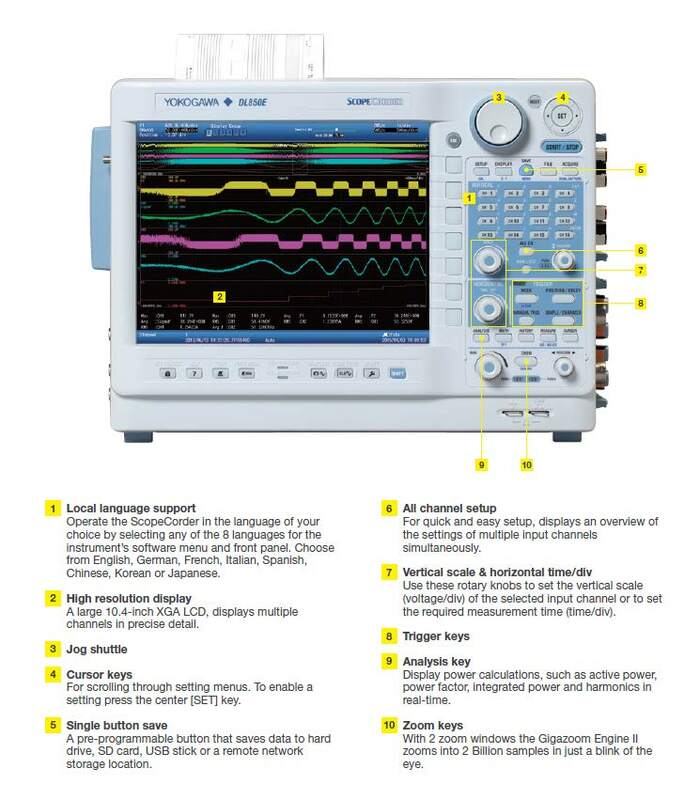 Available real-time digital signal processors calculate math functions or electrical power parameters. 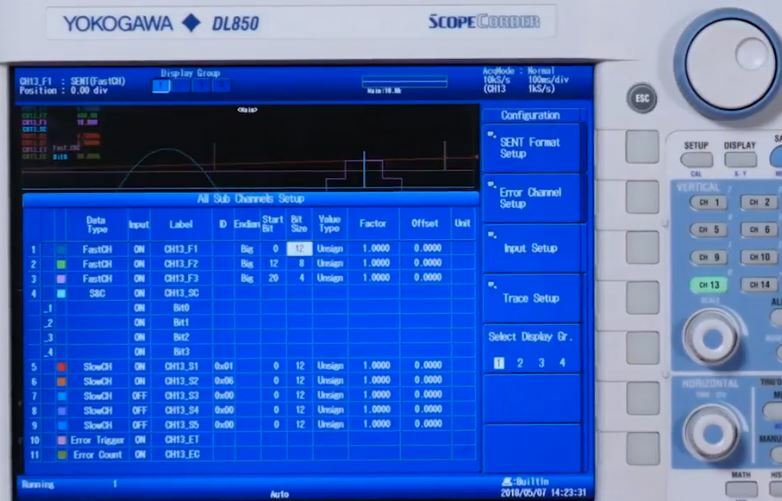 Results are plotted on the screen in real-time and can be measured with cursors, captured with triggers, and saved to disk, making the DL850E a productive tool for motors and drives and other time-based power engineering. Zoom into two billion samples in just the blink of an eye. A dedicated zoom processor can operate two zoom windows with zero delay. Available cursors are horizontal, vertical, marker, degree or combined horizontal & vertical. Capture data for up to 200 days using up to 2Gpoint memory and optional hard disk recording. The History Memory function saves previous trigger data for later search and analysis. 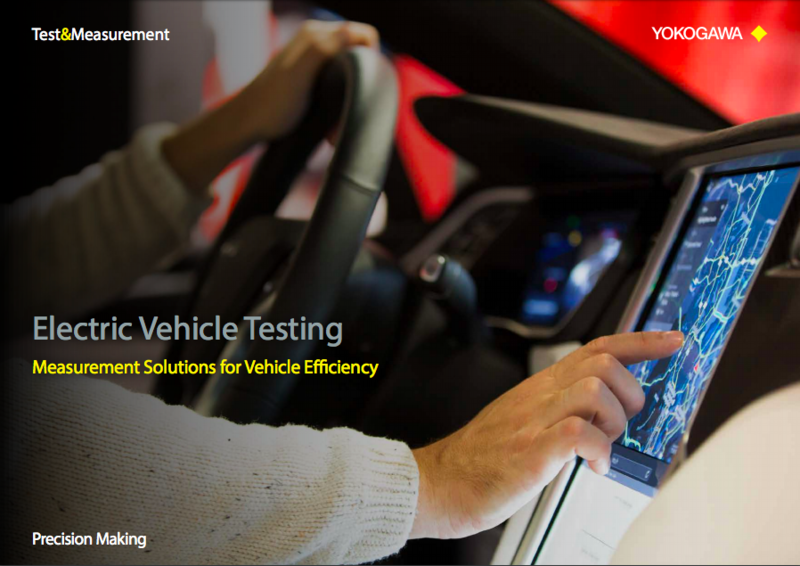 The dual capture function is ideal for long-term testing. Capture the important transient events at a high sample rate while recording steady-state data at a low sample rate. 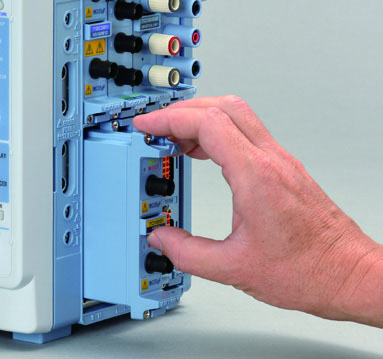 The DL850E automatically switches to a high sampling rate when the trigger condition is met. Correlate data with important events using the optional GPS and IRIG timing functions. The DL850E internal clock and sample clock can be aligned to synchronize multiple systems in remote locations. Merge data sets using XViewer PC software for easier analysis. 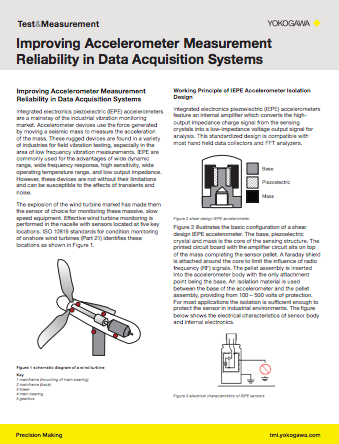 Get results faster with real-time signal processing for electrical power parameters. Trend calculations such as active power, power factor, integrated power and harmonics, using a dedicated Digital Signal Processor (DSP) that is able to calculate and display up to 126-types of electrical power related parameters in real-time. This enables the user to display raw waveform signals such as voltages and currents along with power calculated parameters and even the capability to trigger on all of them. Data updating rate up to 100kS/s. 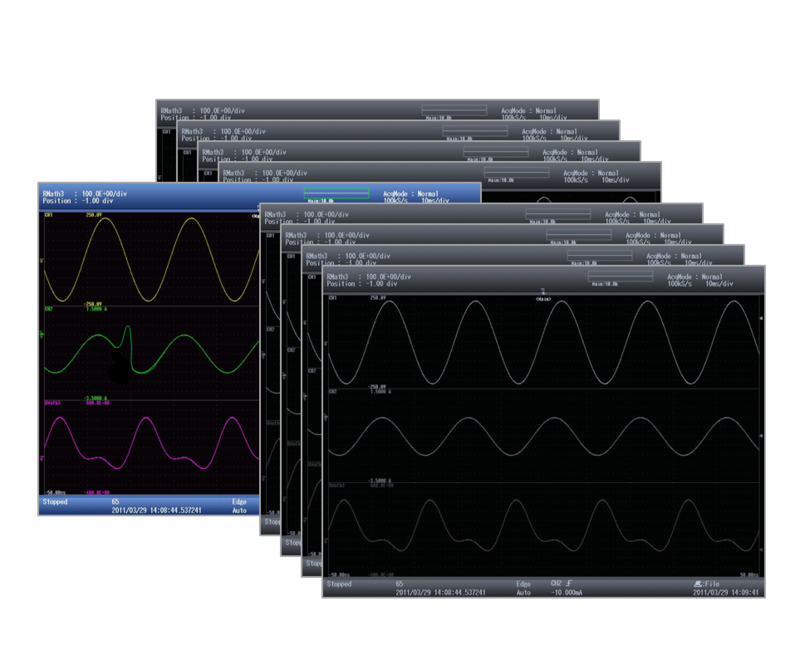 Trend waveforms of each order of harmonics, bar-graphs and vector displays can be displayed. 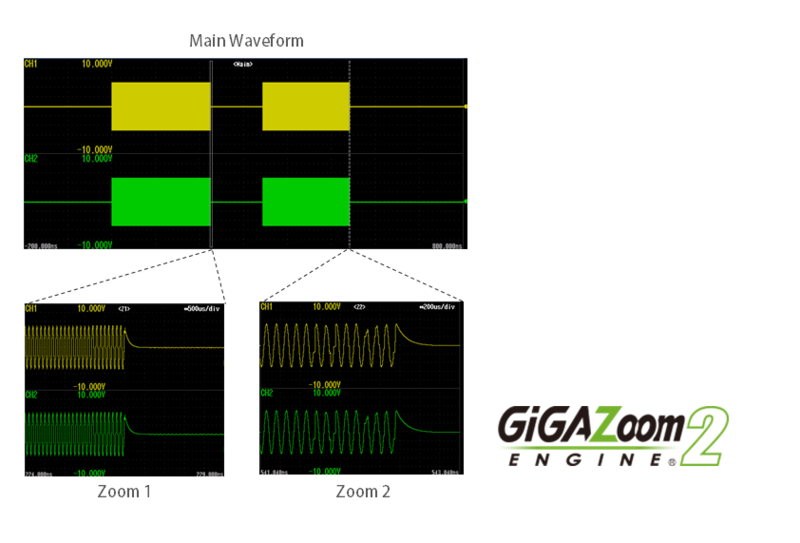 Both RMS and Power analysis modes are available. Besides the powerful power calculations, the /G5 option also contains all the functionality of the /G3 real-time math option. 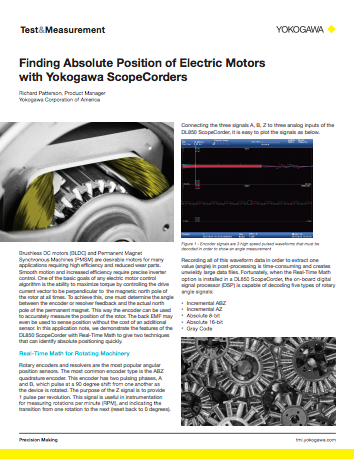 The ScopeCorder Vehicle Edition is designed for engineers working in the automotive and railway industry, providing a thorough insight into the dynamic behavior of the electromechanical system. This integrated approach results in considerable time saving compared to using multiple separate instruments. As a standard feature, the ScopeCorder is equipped with a set of basic arithmetic functions such as addition, subtraction, division, multiplication, Fast Fourier transformation and more. In addition to standard math, advanced real-time analysis functions are available. Armed with a dedicated digital signal processor the ScopeCorder can perform mathematical calculations such as arithmetic operators with coefficients, integrals differentials, and higher order equations on acquired measurement data. 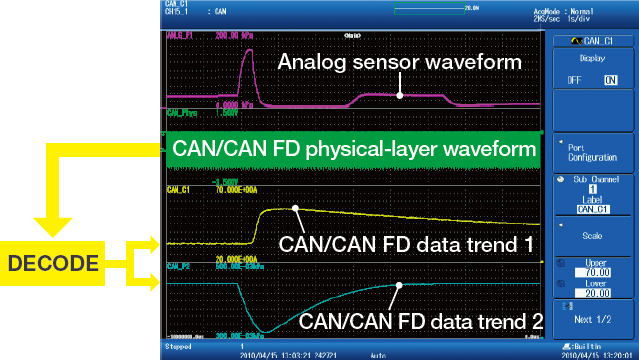 The results of these calculations are displayed during waveform capture in real-time. 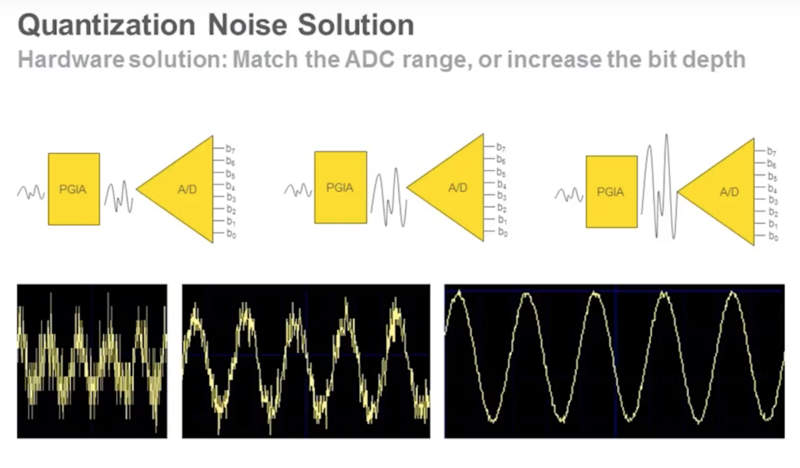 In addition to mathematical operators, steep digital filters can also be selected to isolate or trigger on the amplitude of certain frequency components. 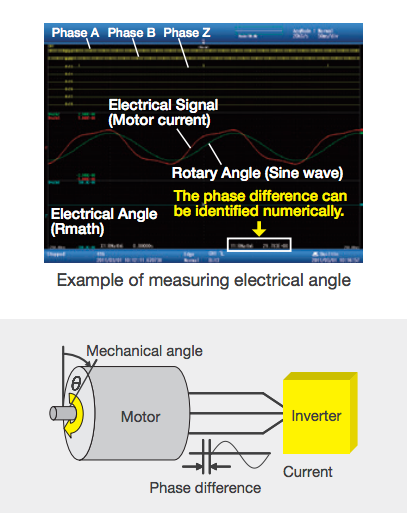 Measuring the electrical angle corresponding to the mechanical angle is important for understanding motor characteristics. The Electrical Angle operation enables the extraction of the fundamental component of current by Discrete Fourier Transform, then the calculation of the phase difference between it and the rotary angle in real-time. A trend of the phase difference can also be displayed in real-time. With user defined computations it is possible to create equations using a combination of differentials and integrals, digital filters, and a wealth of other functions. Moreover, it is possible to perform various types of FFT analysis using two FFT windows. In applications such as vibration and shock tests, you can easily evaluate abnormal vibrations while simultaneously measuring other signals. A ScopeCorder has been designed to grant users access to functionality in the field quickly and easily using the front panel menu buttons. For users that prefer workbench operation it is possible to connect a USB mouse or keyboard. Analyze measurement data using the ScopeCorder itself or on the PC using the Yokogawa Xviewer software or select any of the drivers below. Please download "free software" and "Trial Versions" in the software tab above. Xviewer lets you transfer files between the DL850E series and a PC and allows you control your ScopeCorder remotely using your PC. 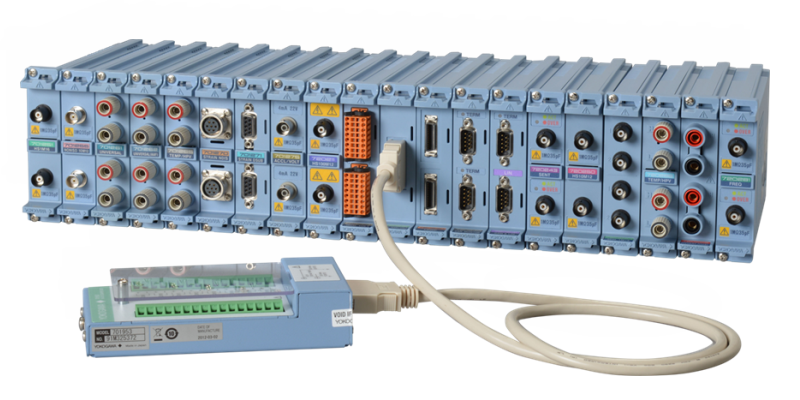 XWirepuller enables Yokogawa’s digital oscilloscopes and ScopeCorders to be controlled from your PC via the Ethernet, USB, or GP-IB interface. When the software program starts, the front panel image of the connected instrument appears on your PC. You can control the instrument from your PC with the mouse to simulate operations using the front panel keys of the instrument. National Instruments LabVIEW Driver for DL850 is available on National Instruments web site. WDF File Access Library is the special library to access waveform data files saved in WDF format. * VisualStudio 2008 SP1 is required to use this software. The ScopeCorder DL850E was designed with built-in antialiasing filters to accept inputs from wide bandwidth, high voltage accelerometers, providing low impedance inputs for excellent noise eliminating characteristics. Properly orienting the north pole of the rotor is critical to the goals of Field Oriented Control and allows the results of the Park and Clarke transformations to be more accurate. The DL850 with Real-Time Math eliminates programming and post-processing, serving as an essential tool for the motor drive designer or drive system integrator. Suitable for testing and long term monitoring for power generators and multi-output power supplies. Provides dynamic analysis of multi-channel data recording applications. Applicable to DL350 and DL850 series. This is a multichannel voltage module capable of measuring 16 channels of DC voltage on a single unit. To be used with 701953 Scanner Box. 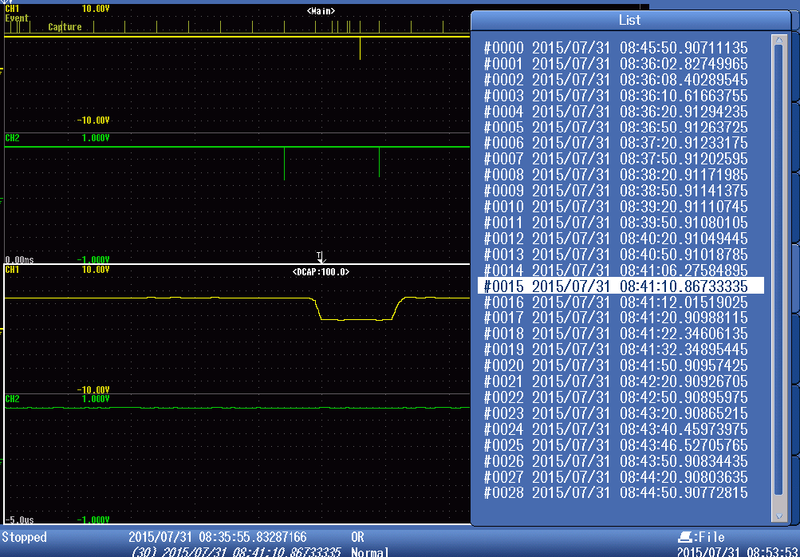 Input logic signals can be displayed as waveforms at 10 MS/s sampling resolution. Each port can measure 8 bits, and 2 ports of input are available on each module. Thus, a single module can observe 16-bit logic signals. Compatible with 700986, 700987, 702911 and 702912 logic probe. Use the CAN/CAN FD Monitor Module to decode the CAN/CAN FD-Bus signals and display information on physical data like engine temperature, vehicle speed and brake-pedal position as analog waveforms and compare this with the data coming from real sensors. Applicable to DL850V & DL850EV, DL350 (/EV option) ScopeCorder Vehicle Edition only. Use the CAN/LIN bus monitor module to decode the CAN or LIN-Bus signals and display information on physical data like engine temperature, vehicle speed and brake-pedal position as analog waveforms and compare this with the data coming from real sensors. Applicable to DL850V & DL850EV, DL350 (/EV option) ScopeCorder Vehicle Edition only. Use the SENT monitoring module to decode the SENT protocol signal and display information on physical quantities from SENT output sensors. The 720930 and 720931 passive clamp-on current probes allow current waveform readings directly via analog input modules on ScopeCorders including the DL350 and DL850 using isolated BNC connections. The 720931 passive clamp-on current probe anables current waveform readings directly via analog input modules on ScopeCorders including the DL350 and DL850 using isolated BNC connections. For the DC power supply model (/DC). Cigarette lighter plug type. For the DC power supply model (/DC). Allgator clip type. 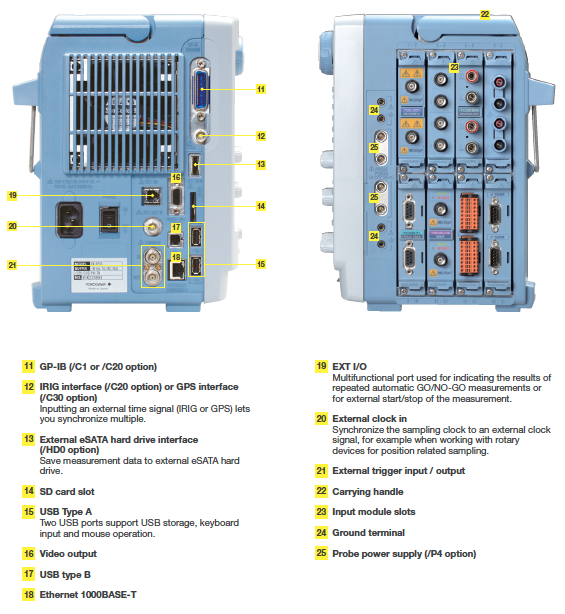 Applicable for DL850 and WT300 series.